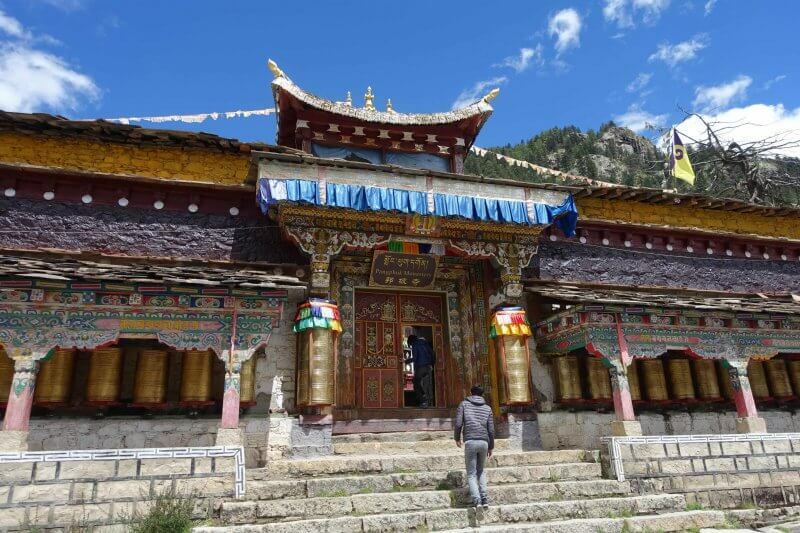 The gateway to Yading Nature Reserve, Daocheng. While it certainly isn’t a top destination, there are still things to do to keep you busy for a day or two. Also a great way to get away from the crowds that mark almost every other tourist spot in China. 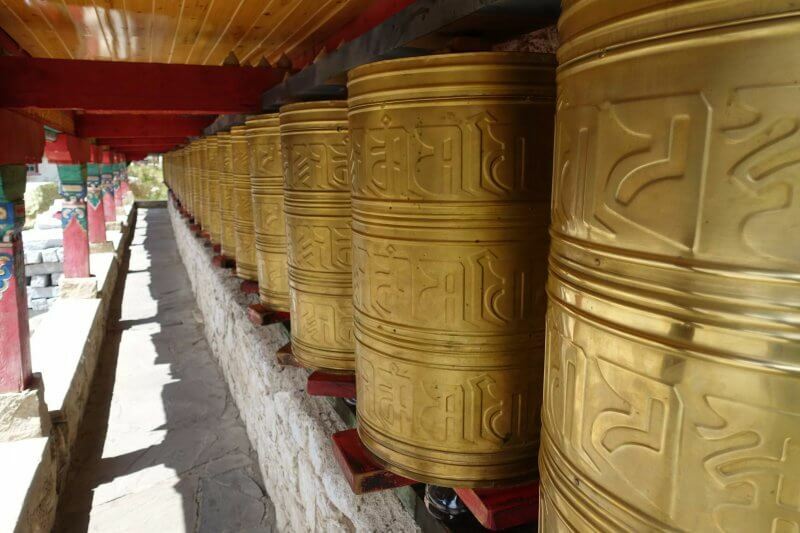 We continued on our journey towards the last Shangri-la, Yading. 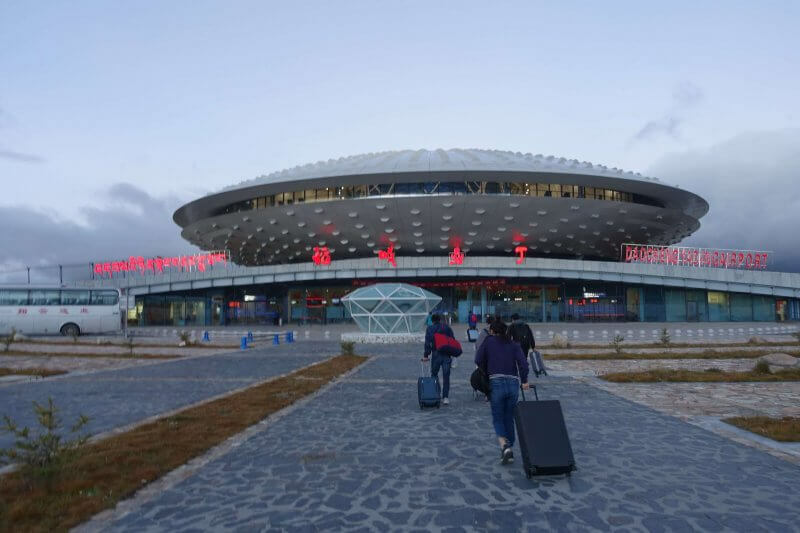 After Kangding, the next stop, Daocheng, home to the highest civilian airport in the world. 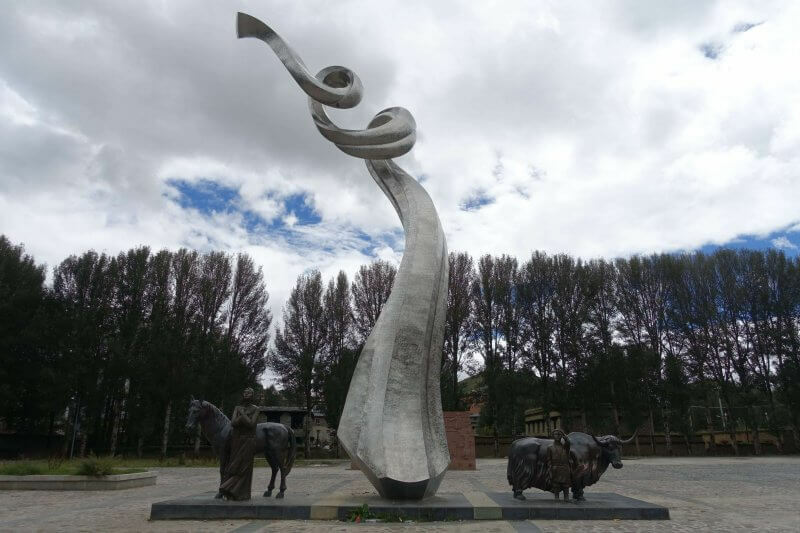 The bus from Kangding to Daocheng departs once a day early in the morning from the same bus station for buses to Chengdu and a couple other destinations. 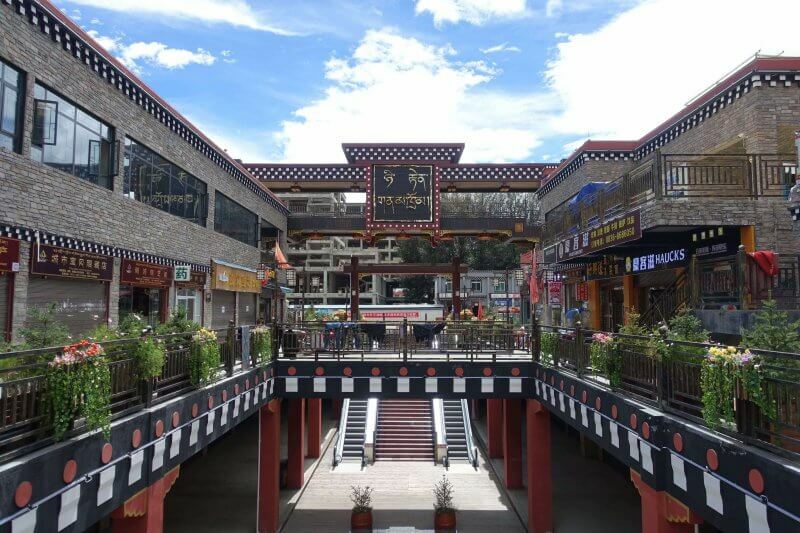 The ticket from Kangding to Daocheng costs 166 CNY and can be purchased at the bus station, ideally a day or more before departure, as the bus does fill up. Getting tickets and getting to the bus station was fairly straightforward. Finding our bus though, was slightly complicated. The situation that morning was chaotic as many buses we due to depart at around the same time and there wasn’t clear signage on where to wait for our bus, which eventually arrived but waited at the back. I think it would have been worse if we couldn’t speak any Mandarin. After attempts to ask around and being directed in circles we found our bus, to much relief. 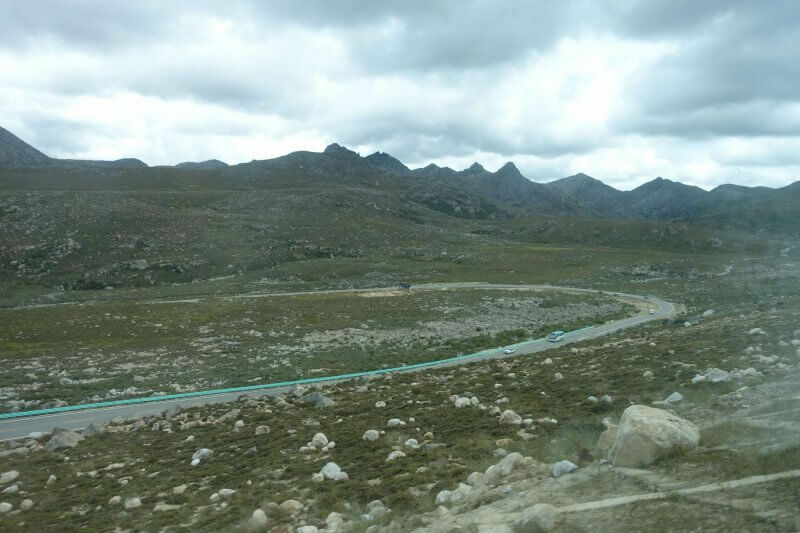 The ride over the mountains from Kangding to Daocheng is a highlight on its own, but as much as I’d love to have just sit back and enjoy the scenery, I realised that finding our seat on the bus was not the hardest thing to deal with that day. The fog that morning was really bad, and traffic was limited to a crawl. We stopped for long periods at some parts, and couldn’t make out what was going on as it was all dark and foggy outside. Seated beside me was an old man who seemed pretty friendly and was traveling around China on his own. 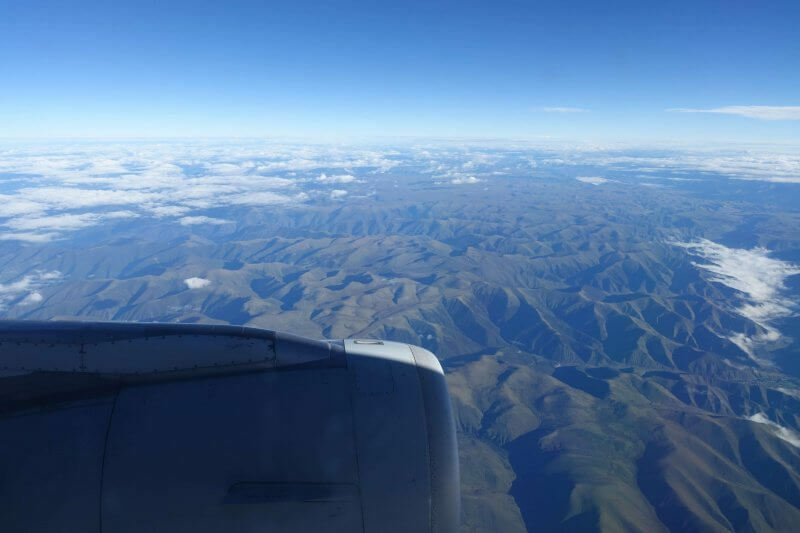 At first I thought it was nice to have a friendly guy next to me for the long ride to Daocheng (11 hours), but soon it became apparent that he was just intent on going on and on about how great China is and how all other countries mean nothing to him. It was just unbearable after an hour. Great, no scenery still, and 10 more hours to go. The sky started to light up, but I wasn’t sure if it was a good thing that we could see (or not see) how bad the conditions were. The winding mountain road, even after the fog had lifted a little. Anyway, I shan’t discuss about my bus buddy further, whose 70 year old body seemed to have way more energy than the other 30-40 year olds on board and couldn’t stop going on. Just imagine that, while trying to enjoy the scenery below. 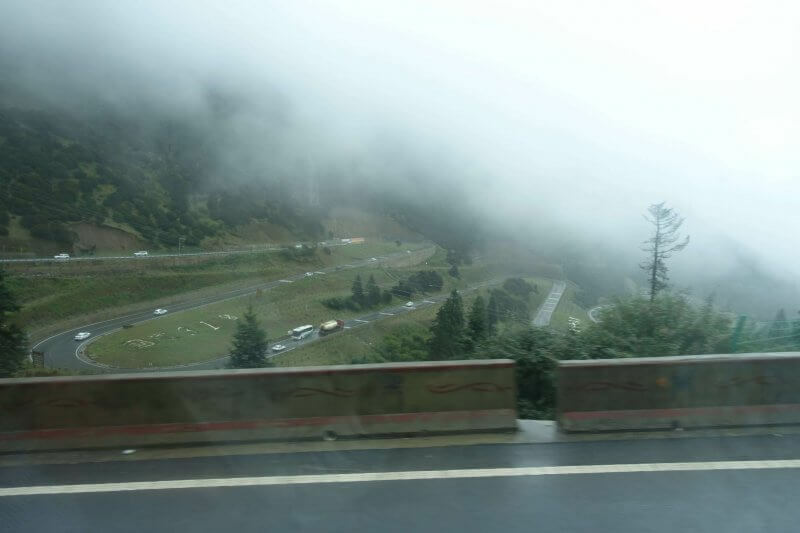 The road climbed from 2,600m above sea level at Kangding to up to 4,700m above sea level at some point. Didn’t manage to get many good pictures with the twists and turns but you’ll get the idea. Just past the first mountain pass, and suddenly able to see beyond the clouds. Stopped for a short toilet break here. Everything was beautiful, outside the toilet. 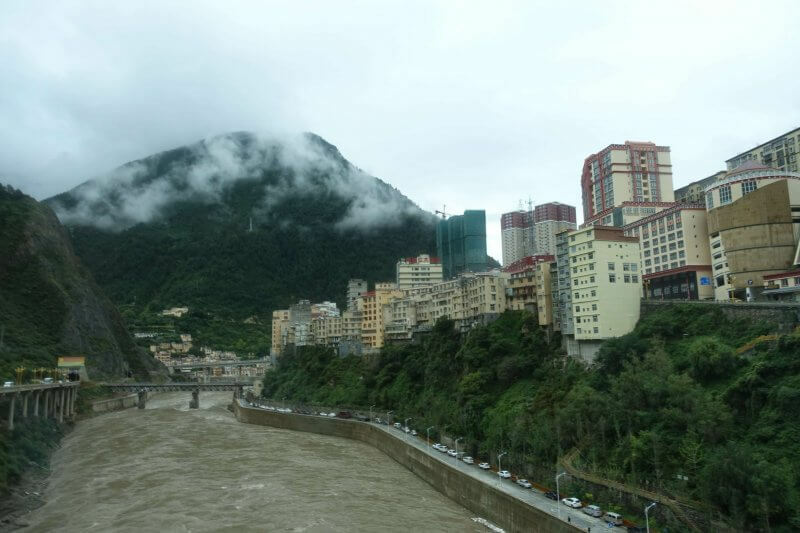 And Chinese engineering continuing to show, here with a high rise buildings perched precariously on the mountainside. Endless turns to get to the top of the mountains. 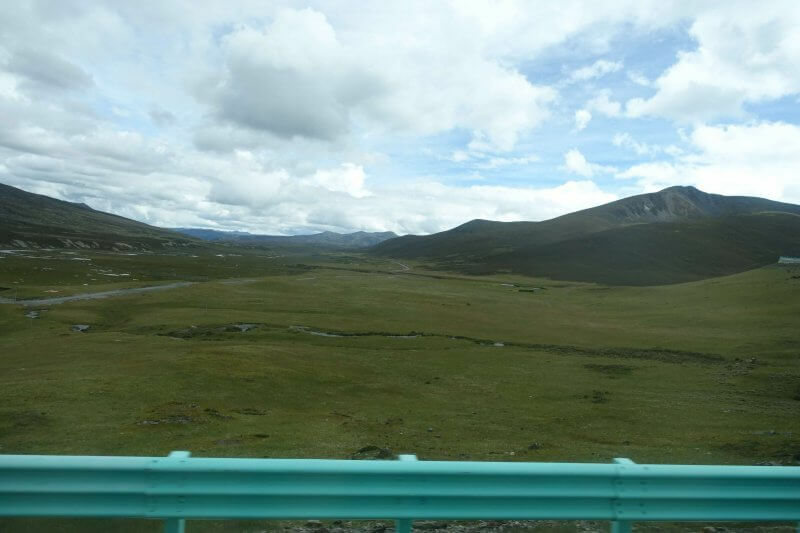 Finally, we got beyond the clouds and mountains and all that we could see was endless grasslands of the West Sichuan highlands. Traffic stopped a few times for yaks to cross. Reminds me of Central Asia. A pity that camping/ long distance trekking doesn’t seem to be that popular in China. Just before you get distracted by the scenery, a reminder to keep your eyes on the road. 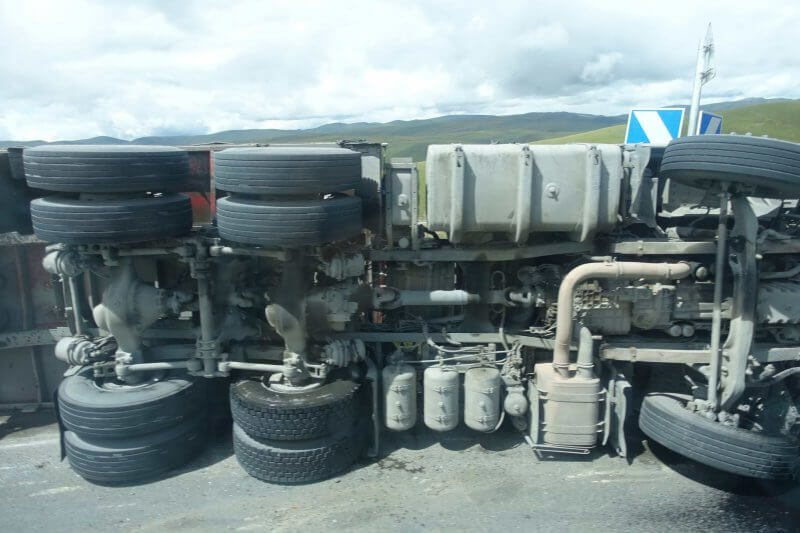 This appears to have just happened as the axels were still spinning when we passed. The bus stopped for lunch at service center just outside Litang around 1pm. If you brought tea or cup noodles you can get hot water here. 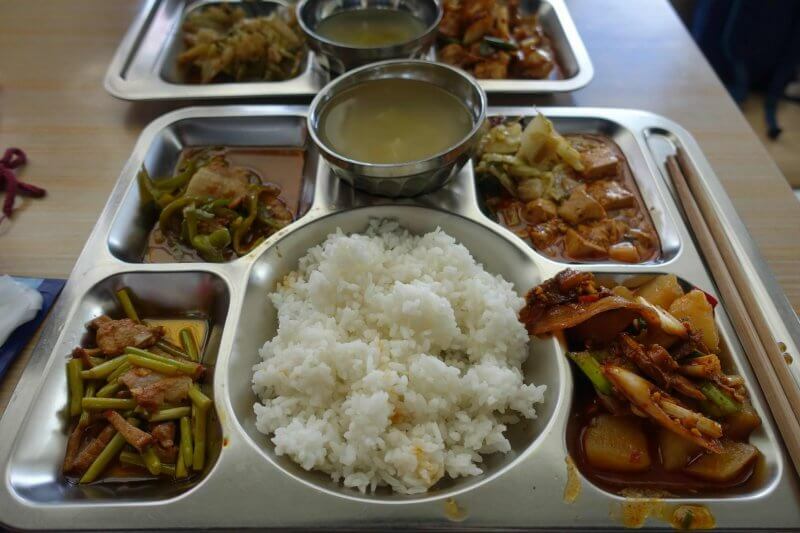 Alternatively you can purchase the set lunch (which we did) for a slightly pricey 30 CNY. Eating everything from a plate with chopsticks was tricky though, so if you’re not used to chopsticks you might want to have your own utensils ready. Set lunch at a service center near Litang, 30 CNY. 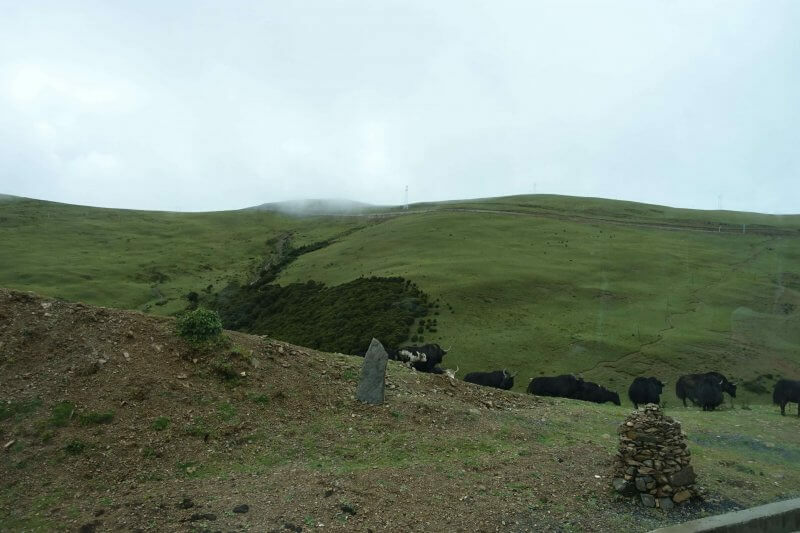 From 3,954m above sea level at Litang, it is another ascent to 4,600m/4,700m before descending to Daocheng at 3,253m. Scenery looked out of this world here, at the edge of the heavens. If you hired a private driver to complete this leg of the journey there’s certainly lots of opportunities along the way to stop and enjoy the view. 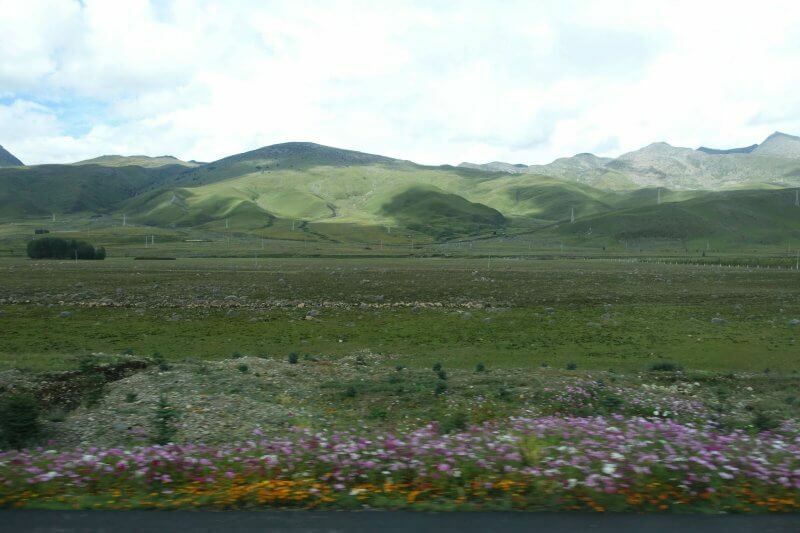 These shots were what I could muster from a moving bus on the roof of the world. A winding road against the backdrop of mountains. 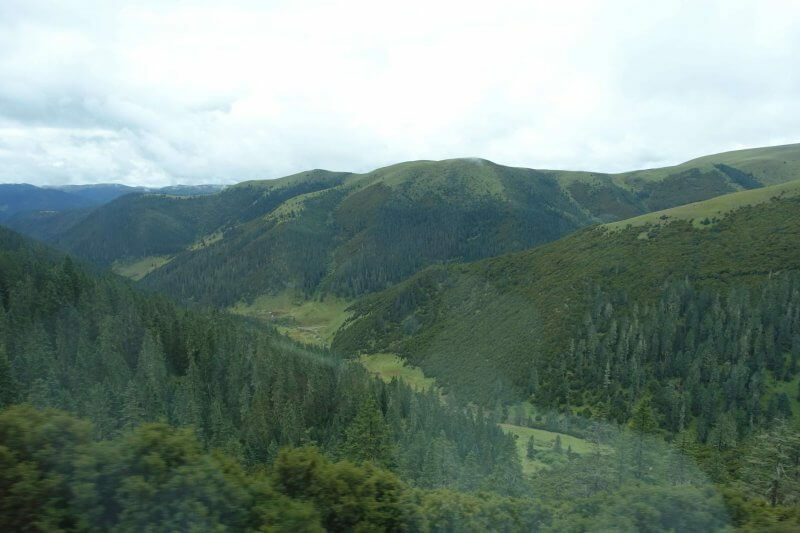 As the highway got lower in altitude again it was less rocky mountains and more grasslands beside us again. We finally arrived in Daocheng probably around 3 or 4 in the afternoon. 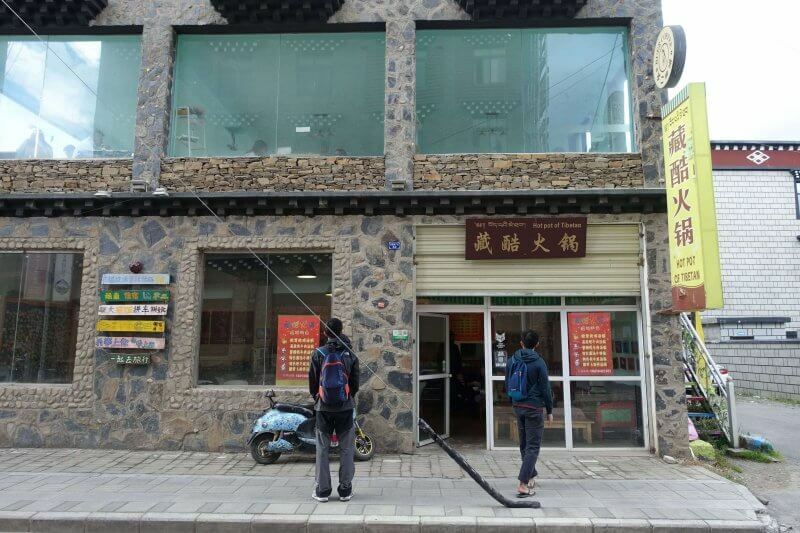 The plan was to stay in Daocheng for a night, then continue to Yading the next day. 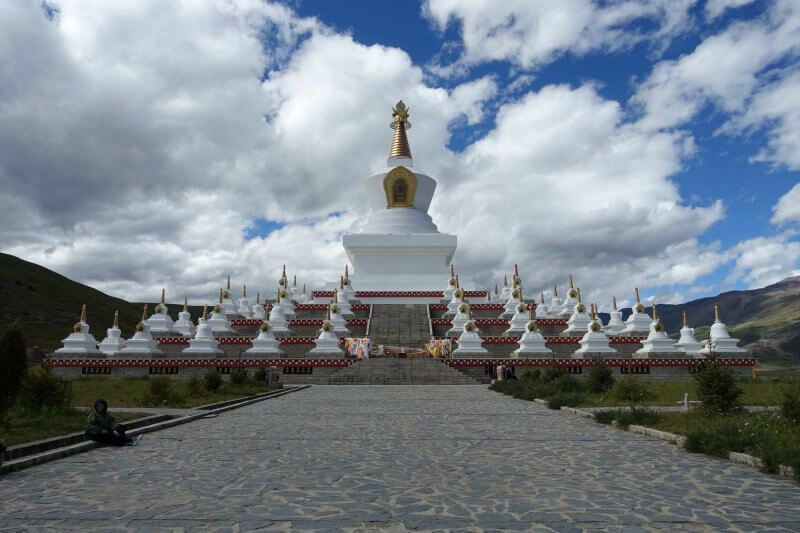 It is also possible to just head straight to Riwa, which is just outside Yading Nature Reserve. The bus station is no longer the one indicated on Google Maps, but instead closer to the coordinates 29°02’02.9″N 100°17’45.5″E. The bundle of energy beside me during the bus ride disappeared as soon as doors opened, and I never saw him again. 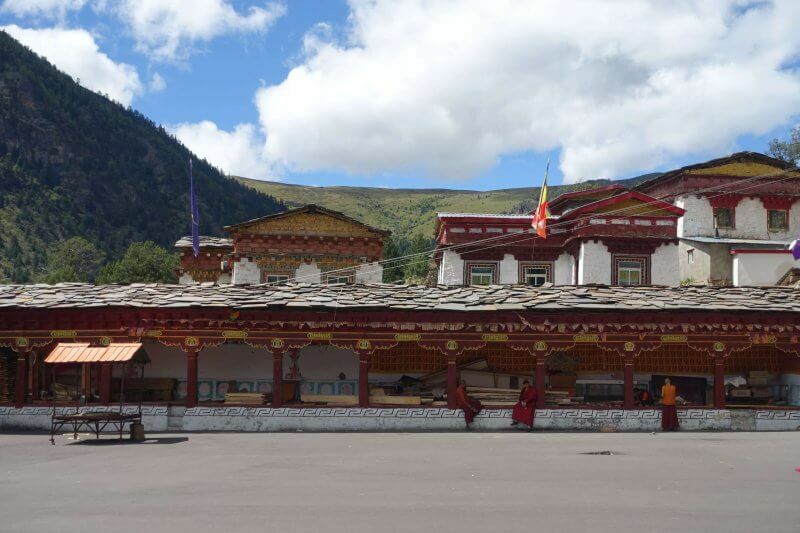 At the bus station there’ll be drivers ready and waiting to get you to Riwa/ Yading for 50 CNY per person, which is the price from anywhere in Daocheng to Yading/ Riwa, one way. 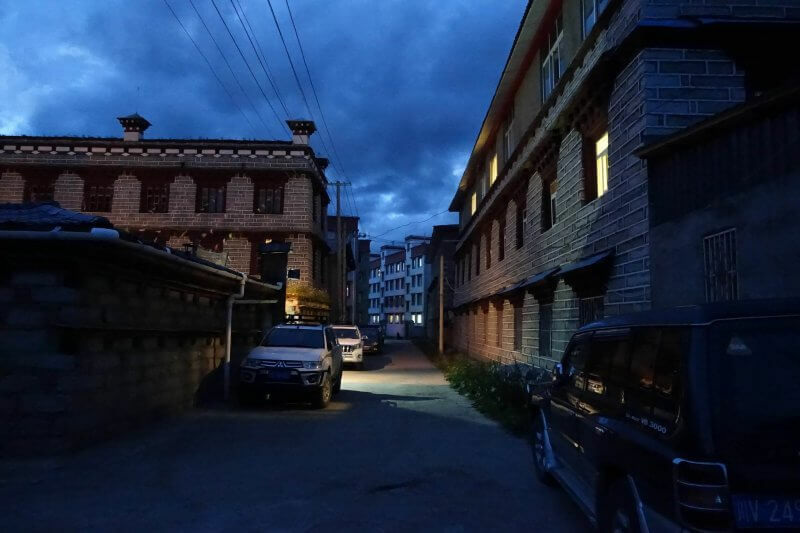 As we had reserved dorm beds at Harvest Inn (also marked wrongly on Google Maps), one of the drivers agreed to get us to the hostel for free if we agreed to go to Yading with his vehicle the next day. The guesthouse was pretty empty in September but apparently in October (China’s national day break) prices go up 3 to 5 times and still gets full. 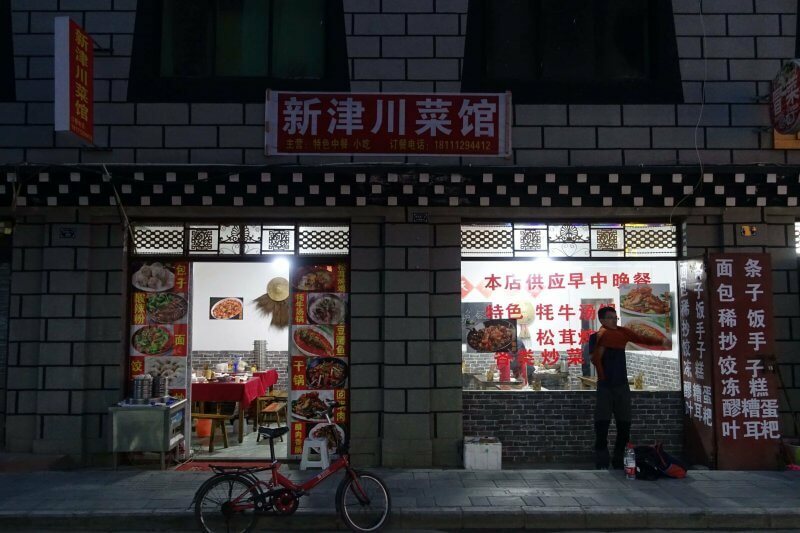 After settling down, it was close to dinner time so we went out for a walk around town to get dinner and last minute supplies for our trip to Yading. 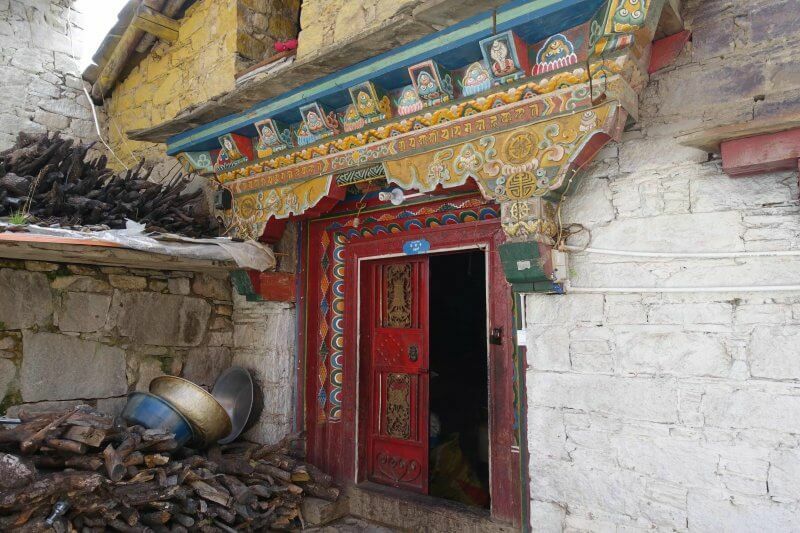 Most stuff you might need for a trip to Yading can be found in Daocheng, including outdoor attire and food. 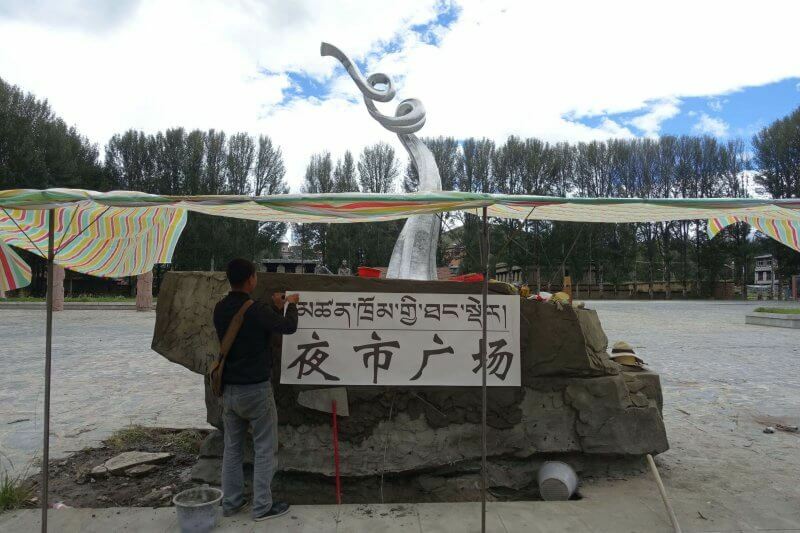 Compared to the earlier cities we were in Yading was much more peaceful (empty) and comfortable to walk around in. The city seems pretty new and clean, and according to sources, a victim of over-investment in tourism infrastructure. A pagoda in the middle of the market. The next morning, it was time for Yading. 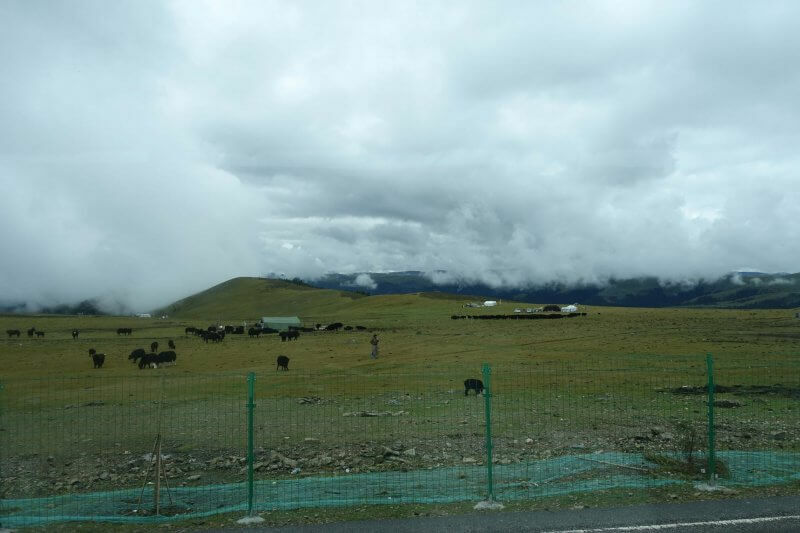 We left in high spirits, but soon found ourselves miserable and wanting to get back to the relative comfort of Daocheng. 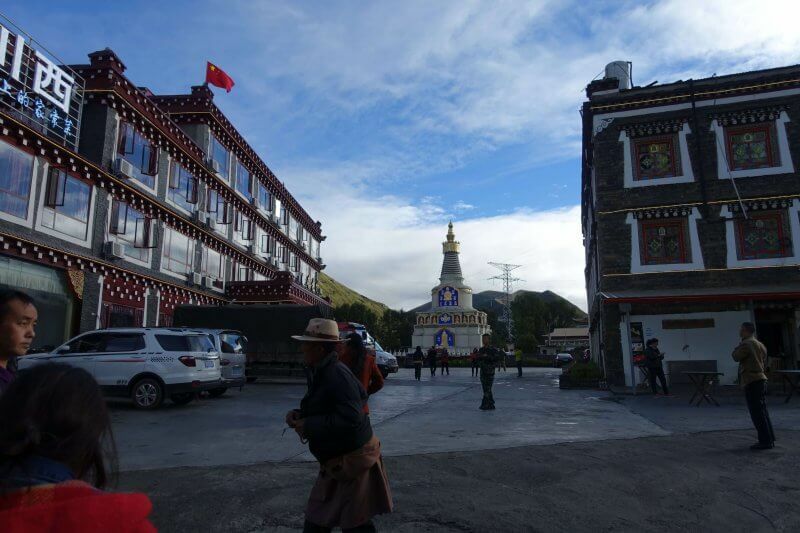 Our plan allowed a maximum of 4 days at Yading, but on the evening of the second day we were back at Harvest Inn in Daocheng. The mountains were spectacular, no doubt, but September probably wasn’t the best time for it. Will add all the details from Yading in the next post, but now, more details on how we spent 2 days at Daocheng, post-Yading! 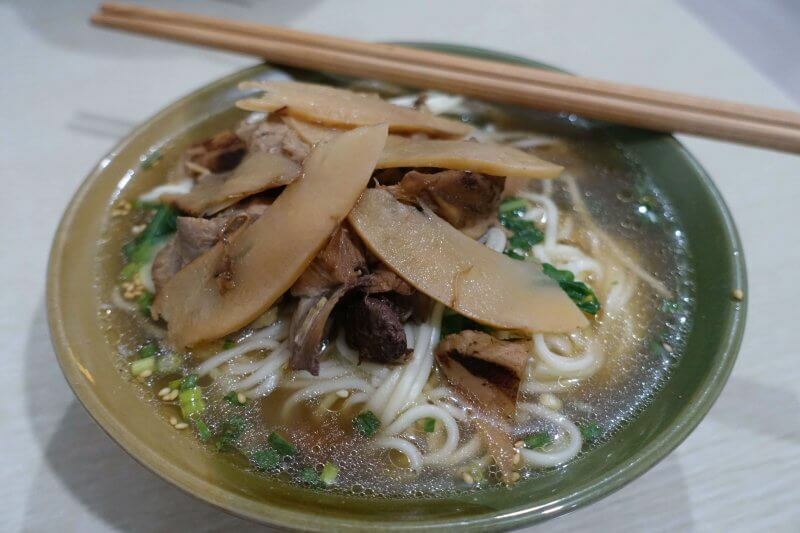 First thing I ate when I got back to Daocheng – a hot bowl of Matsutake chicken noodle soup. 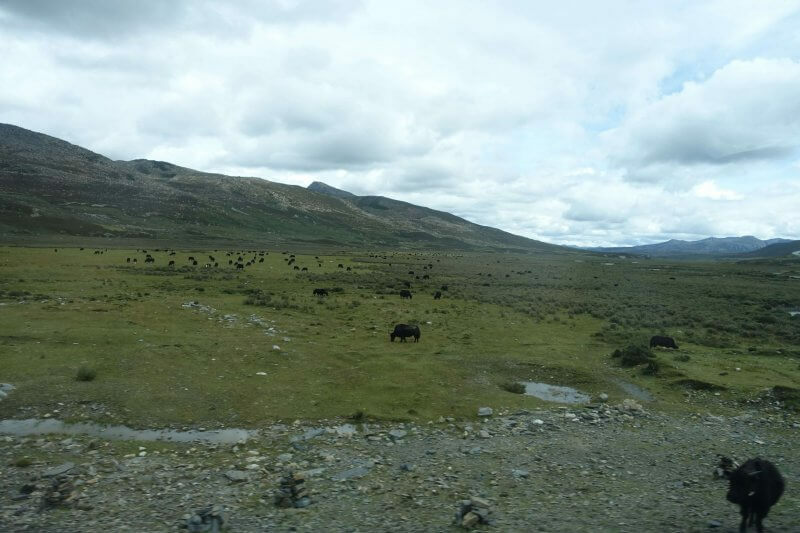 The day after we got back, we were ready for some easy/lazy exploration of Daocheng. 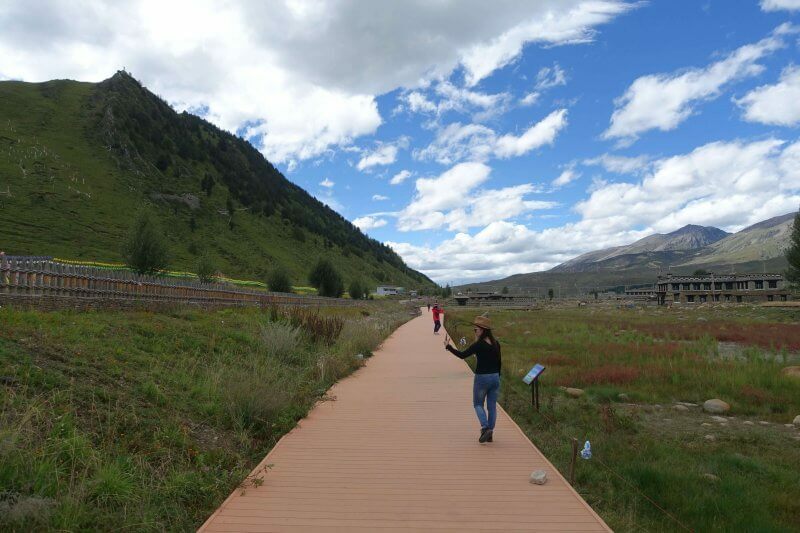 The main areas of Daocheng can be reached on foot, and the low (relative) density of people makes walking on the streets quite enjoyable. 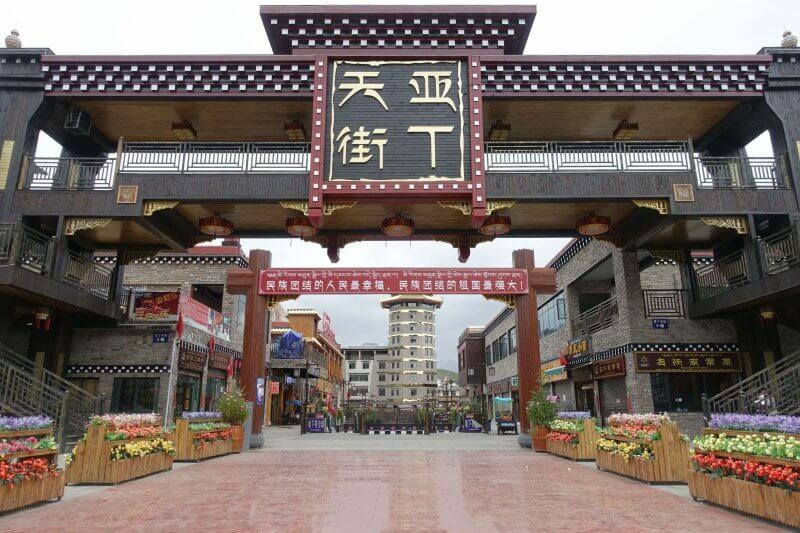 As mentioned, much of Daocheng seems to have been recently constructed, and targeted at tourists. Don’t expect too much culture/history here, but there’s still some local flavour and photo opportunities here. 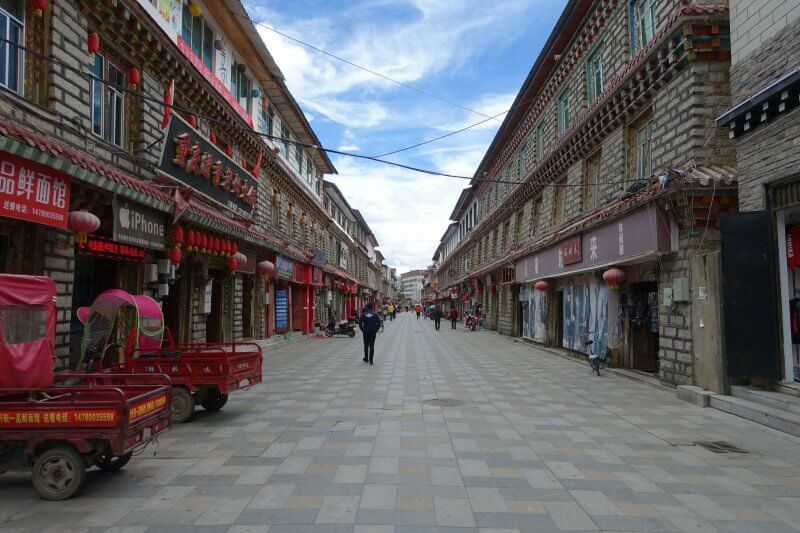 Yading Sky Street (Ya Ding Tian Jie), a spanking new and deserted shopping stretch. We got our fast food fix here at Huacks. Decent for fast food in the mountains. Er-chu street, still nothing much to buy, but nice to have a look around the traditional styled shophouses. A well known local produce is Matsutake, an expensive mushroom. There are also other less well known mushrooms found in the hills surrounding. 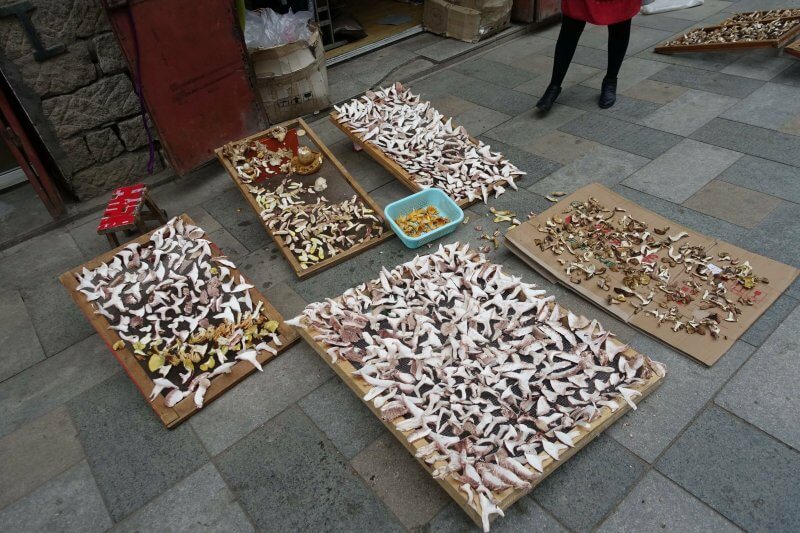 Along Er-chu street, it seems that every other shop had a sideline selling mushrooms, regardless of their business. Everyone was drying mushrooms along the street. A lady from an apparel store brought us in and showed us bags of dried mushrooms hidden under shelves of clothes. Dried mushrooms/ matsutake on display. 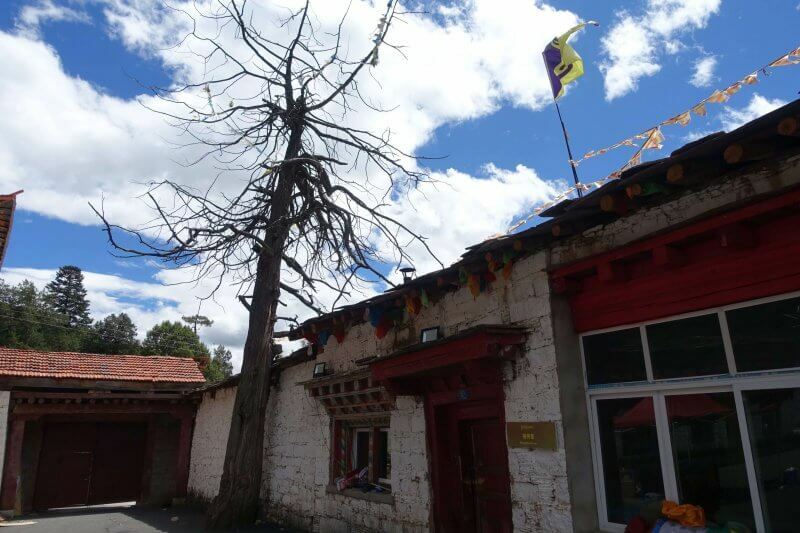 Nearby, the Yading Museum seemed dead. The doors were locked and it looked like no one had been there for awhile. 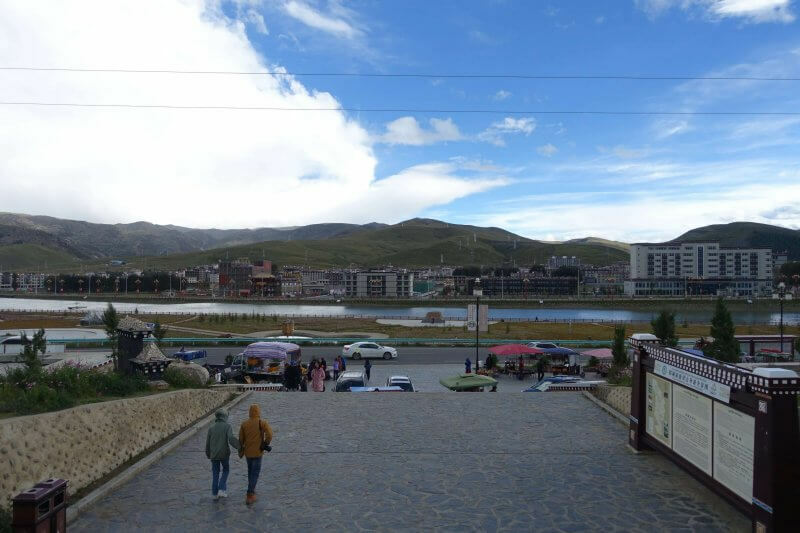 Overlooking the square from Yading Museum. We then continued on to Dexi Street, where most of the business activities seemed to be happening. There were hostels, a supermarket, a hip looking cafe and couple of restaurants so you’d probably be able to live off this street, though without much options. At the end of Dexi Street there was another square which translates to Night Market Square, though I’m not sure if there night markets here. There’s a huge sculpture in the middle of the square, as well as some depictions along the borders of the square. There’s probably some meaning to these art pieces but we didn’t take closer looks. 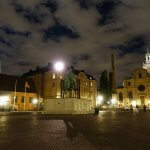 As with the earlier places, the square was deserted. This guy was putting up a sign for the square and asked us for help to check if it was straight. 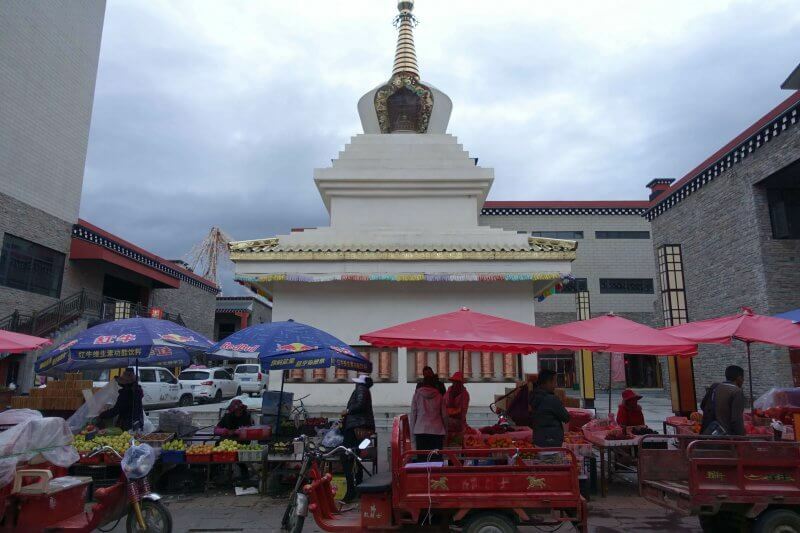 At the northern edge of Daocheng, there is a white pagoda, which seems to be a popular gathering place. 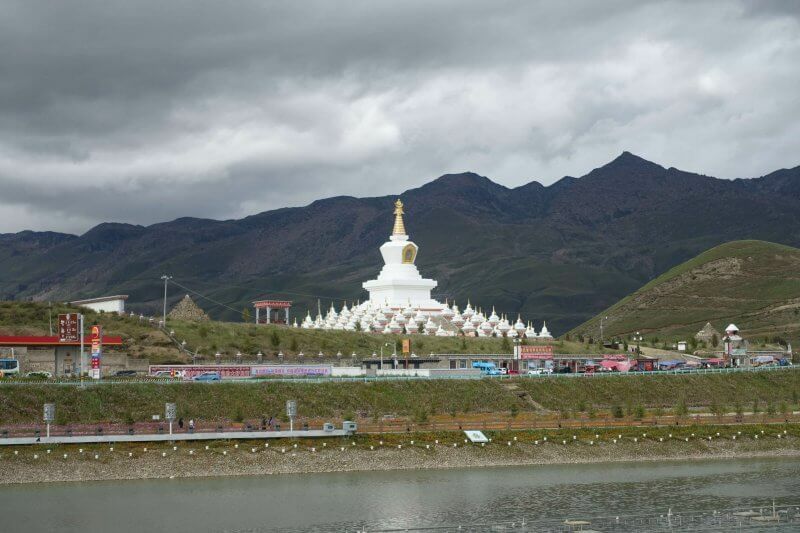 If you’re coming from Kangding/ Litang you would have passed the white pagoda on the way in. The White Pagoda (Bai Ta). The pagoda is across the river from Daocheng, and on the side of the pagoda there is a nice riverside walkway with lots of flowers. Another one of the park of flowers. From the white pagoda, looking back at Daocheng. Got hungry after the walk out to the White Pagoda, and walked back to Daocheng in search of the famous Matsutake Chicken Stew. We first checked out this place below recommended by our hostel owner. 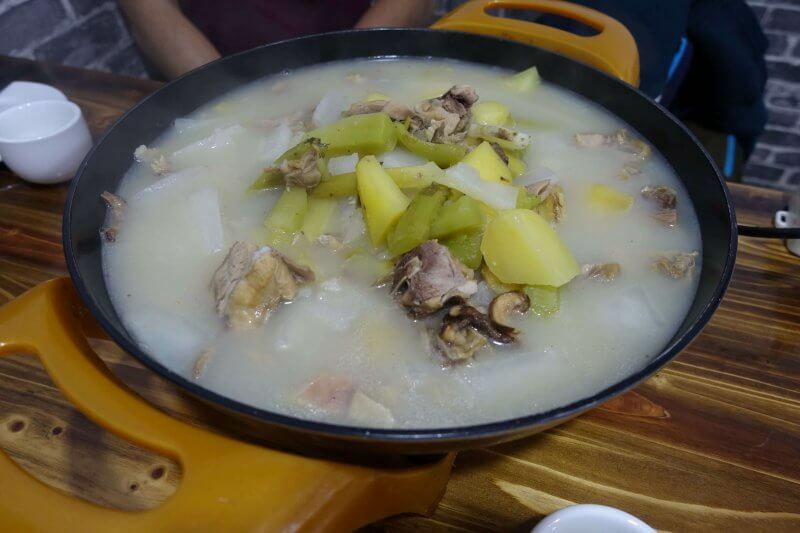 The ‘Zang Ku Huo Guo’ (Tibetan Hotpot) along De Xi Street serves hotpots where you can choose your base (one of which is Matsutake Chicken) and cook meat and vegetables at your table in the stew. It was too pricey for us (can’t remember the exact amount but probably over 300 CNY) so we had to give it a miss. Tibetan Hotpot recommended by our hostel owner. Also along De Xi Street, we found another place serving Matsutake Chicken Stew, at ‘Xin Jin Chuan Cai Guan’. This wasn’t a hotpot but basically had everything together as a dish. Not that cheap too at 170 CNY for the 3 of us but more manageable. The restaurant is run by a friendly elderly couple. The place where we eventually had our Matsutake Chicken Stew. The dish was cooked from scratch in a pressure cooker, and we had to wait for some time for it to be ready. In the end the flavour was pretty rich and the ingredients went well together. Not mindblowing or life changing, but glad to have tried it. Quite a relaxing day back in the city after 2 days at Yading. With our stomachs full it was time to call it a day and we got back to the comfort of our room at Harvest Inn. Dark streets back to the hostel. 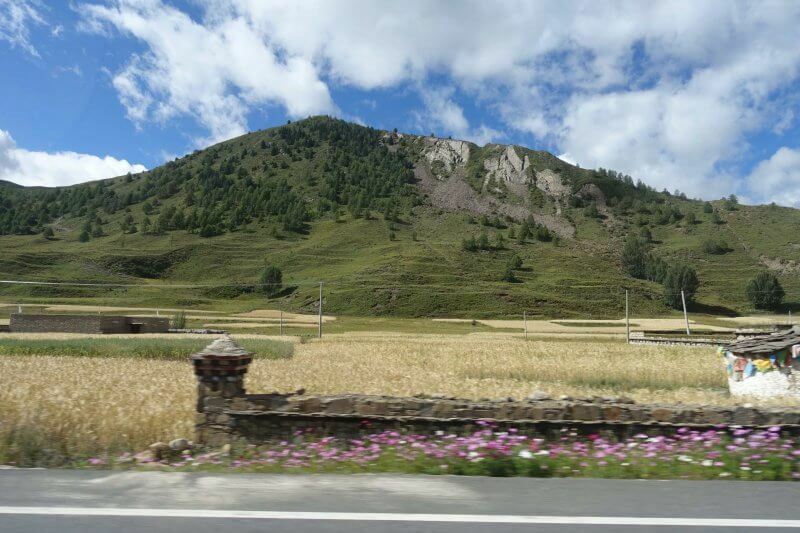 Passing farmland on the way out of Daocheng. 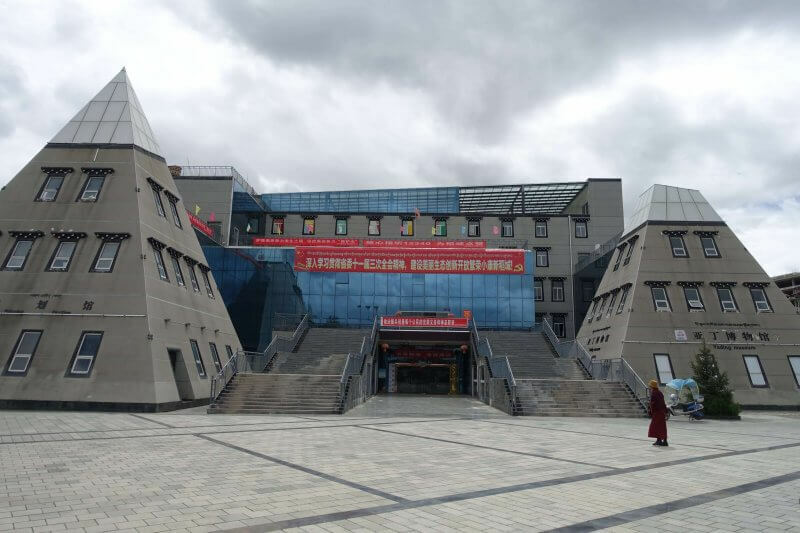 On our last day in Daocheng, we booked a half day trip with our hostel to check out some of the attractions near Daocheng. 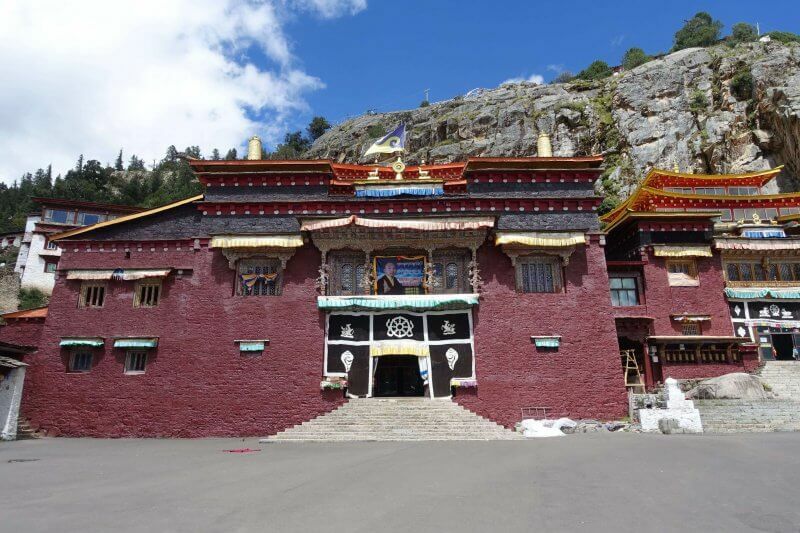 These attractions are actually along the highway from Kangding/Litang to Daocheng, so if you have a driver already getting you from one side to another you might consider just stopping by these places to save time. 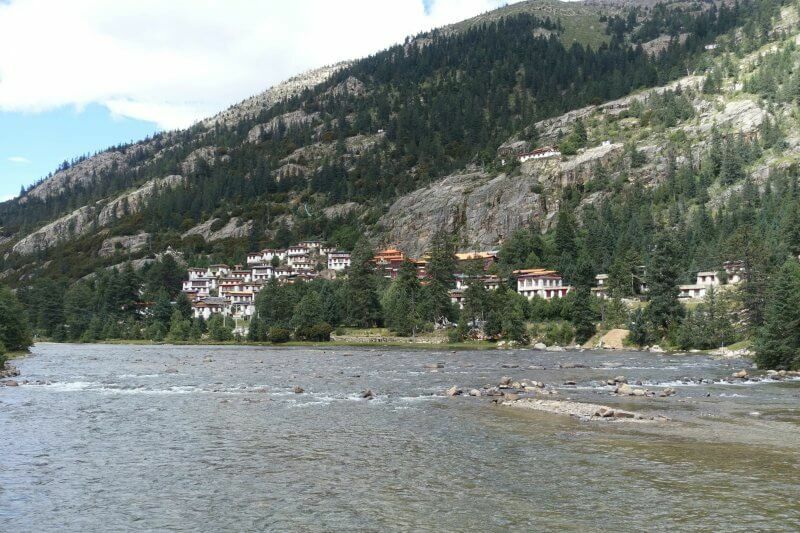 The itinerary was basically Xing Yi Cuo Lake to Ben Bo Monastery to Red Grassland, and was 100 CNY per person. 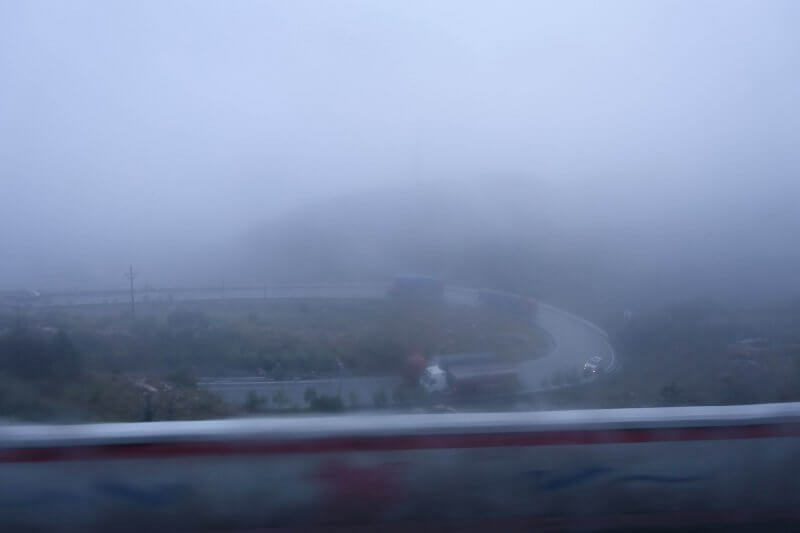 Xing Yi Cuo is around 4,400m above sea level, and the ride to the lake from the highway is very rough. 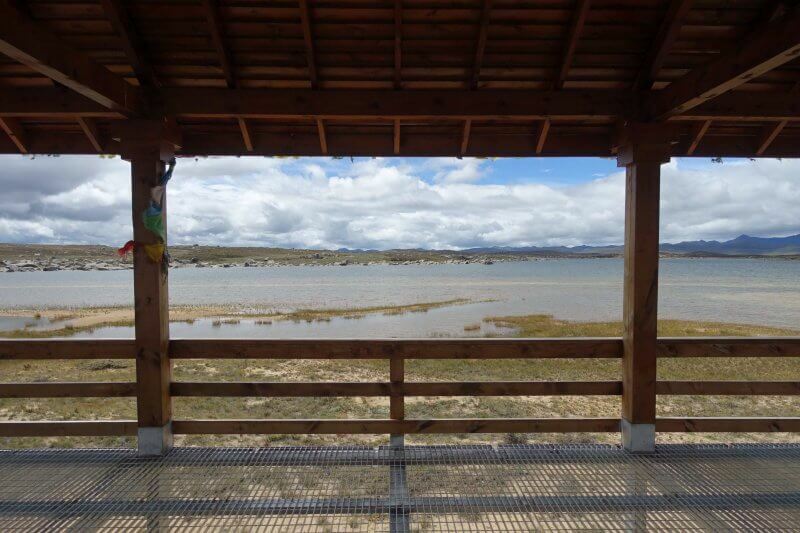 However, once at the lake, it’s easy to get drawn in by the tranquility and serenity of the surroundings. 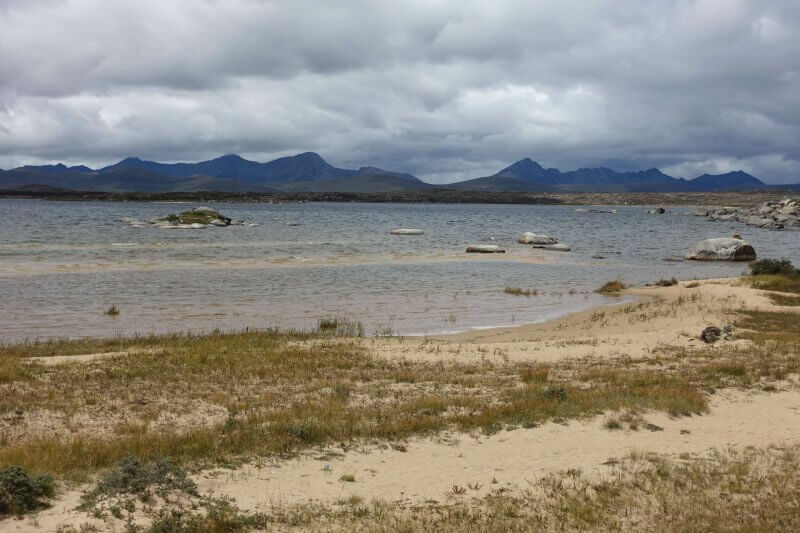 The landscape is unique, with clear freshwater in the lake, fine white sand on the banks, rocky grasslands further away, and sky-scraping mountains in the distance. 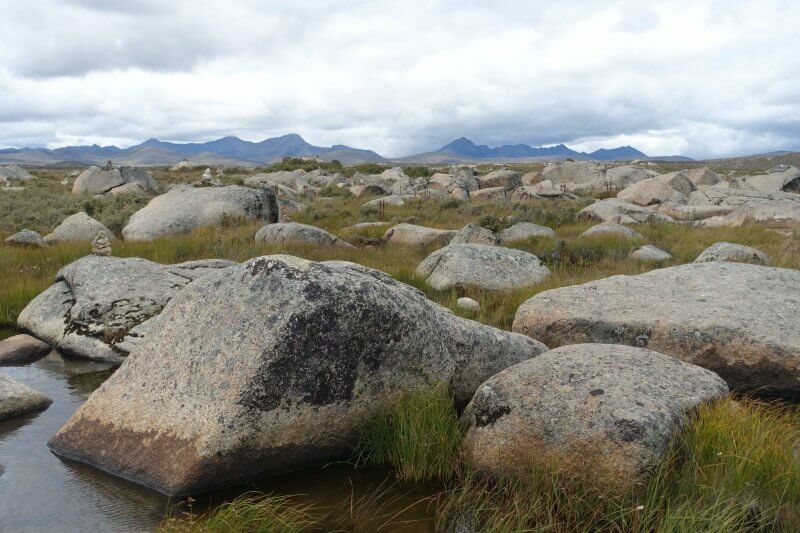 The huge expanse of the highlands. Admiring the lake from the shelter. 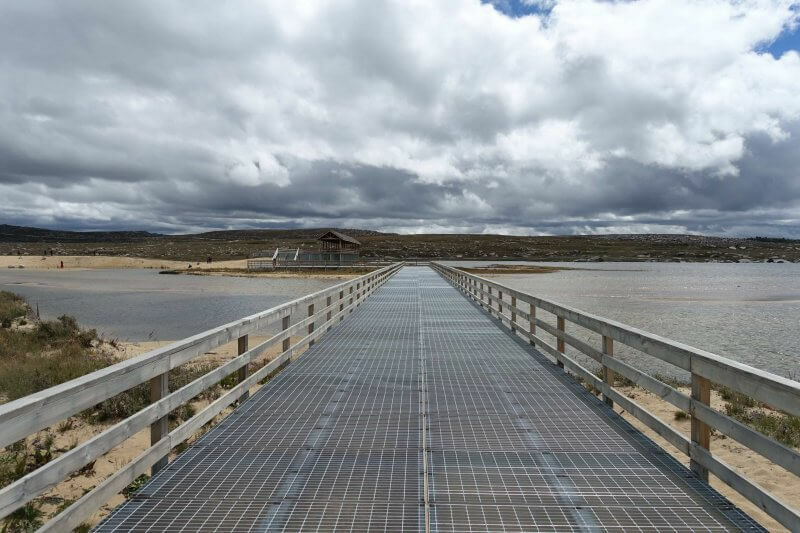 As with other Chinese nature attractions, you can get deep into the attraction without getting dirty, thanks to boardwalks and shelters all the way in. Good for keeping clean, less so for keeping the view pristine. Maybe good for nature too as you’ll be too far from it to wreck any damage. Across the lake, mountains in the distance. Crossing the lake. The path goes in a loop starting/ending at the car park. I wonder how these rocks strewn across the plains came to be. The shelter at Xing Yi Cuo Lake. 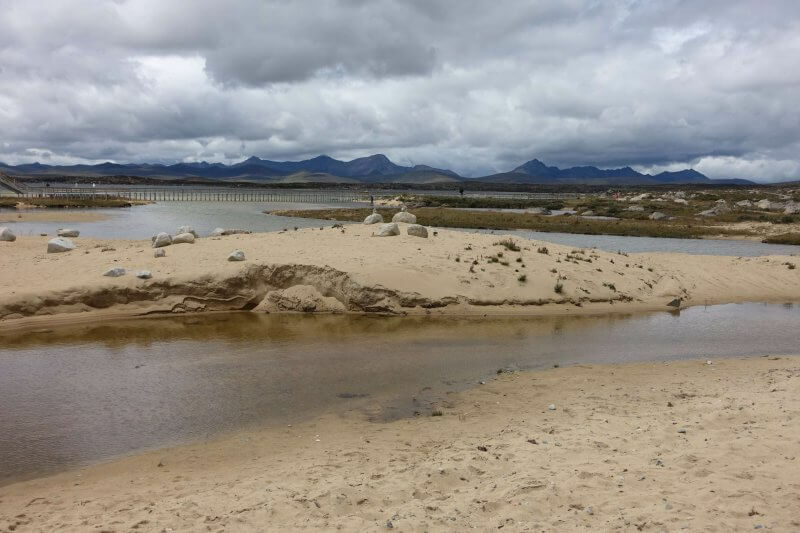 Last one from the sandy shores of Xing Yi Cuo Lake and the mountains touching the heavens. There was perhaps just one or two other groups visiting Xing Yi Cuo Lake when we were there. Glad to have been able to visit while it is still not over-developed. Probably good for an hour on the trail. Xing Yi Cuo Lake was the furthest attraction on our itinerary, and the rest were on the way back. 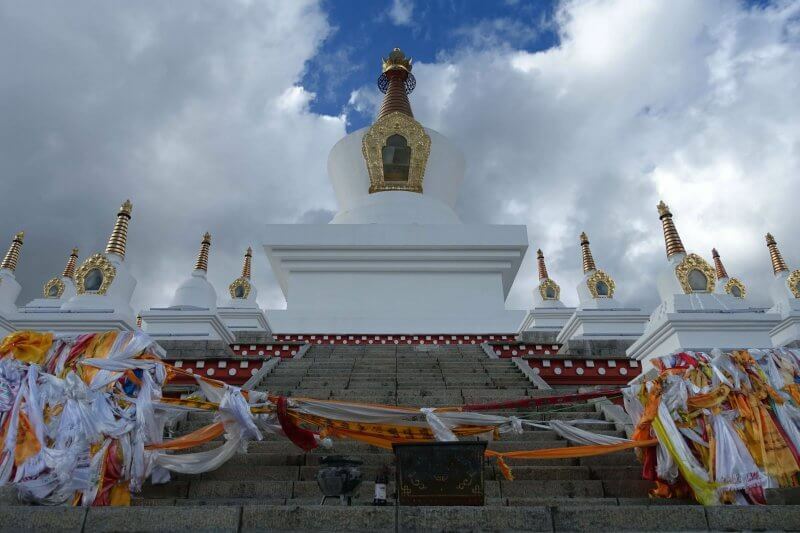 Next, Ben Bo Temple, a Tibetan temple in the mountains. I like how old temples, have a sacred, spiritual air around them. Stepping into them evokes a certain calm, the sudden stillness as I leave the messy, noisy world at the door. An old tree by an old wall. 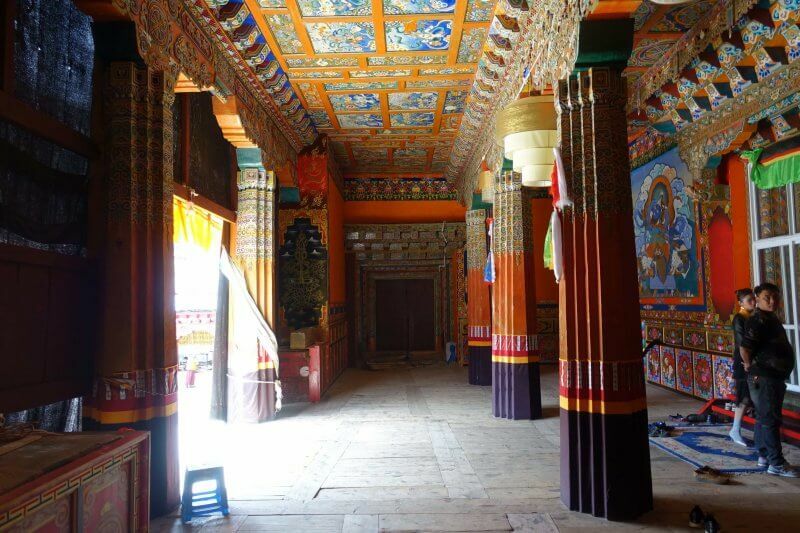 The intricate decorations that are distinctive of Tibetan temples. Inside the prayer halls is another world of its own, especially when prayers are going on. The colourful ancient walls and huge statues must have some stories to tell, if they could. The smell of yak butter candles was too much for me to take though. No photography is allowed inside the prayer halls, but you’d be invited to enter and witness it for yourself. Some monks will be happy to show you around, and it’ll be nice to leave a small donation or purchase a candle. 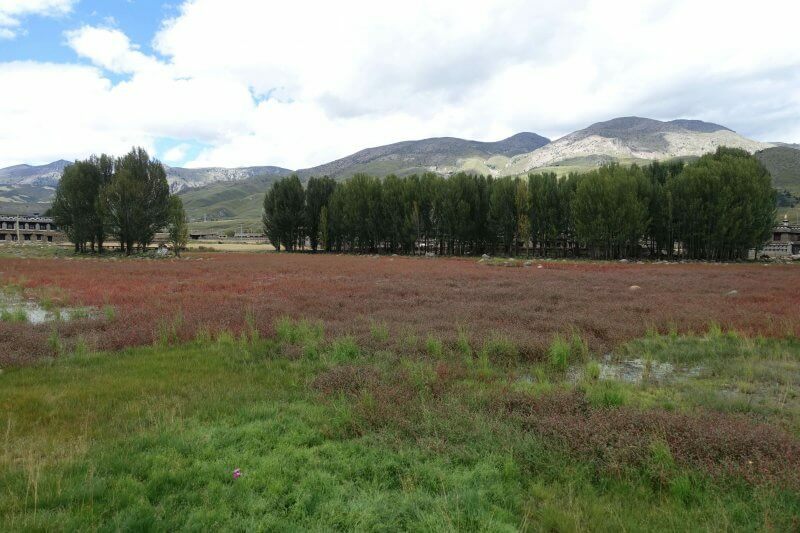 The final stop before returning to Daocheng is a seasonal one. 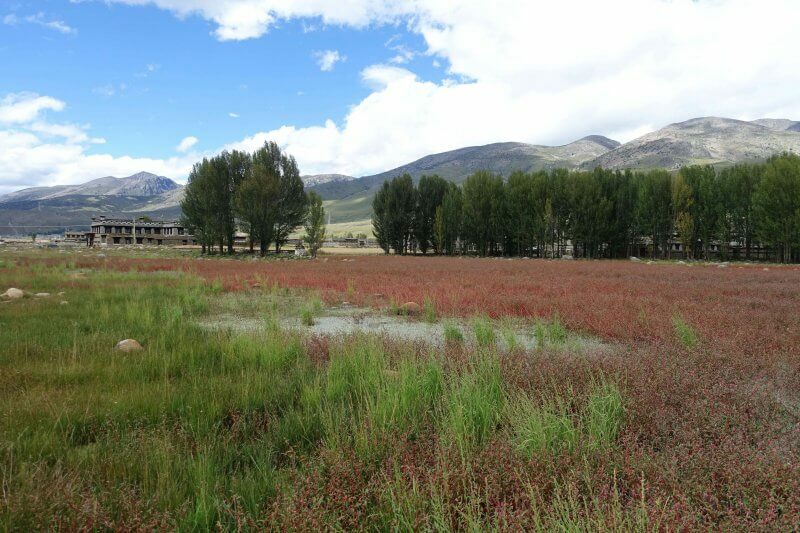 Every autumn, this patch along the highway towards Daocheng turns a bright and vibrant red. We were a little too early for that, and the patch had not turned entirely red yet. Should be better in late September/ early October. 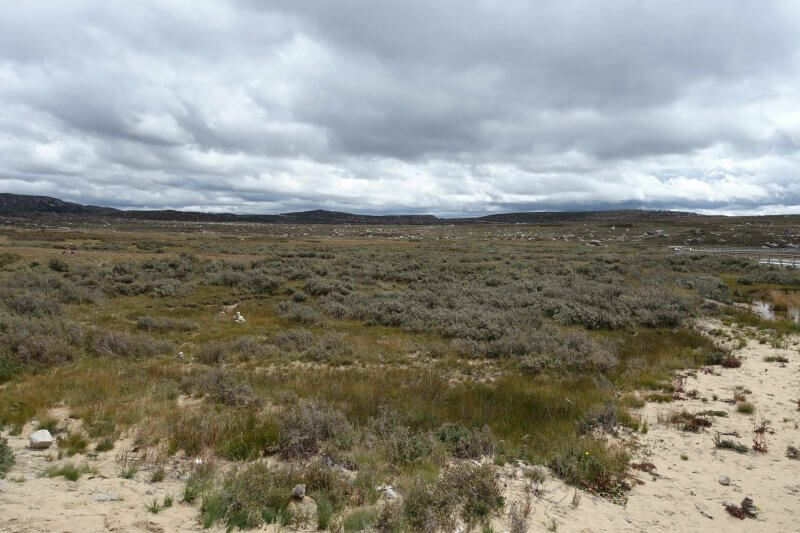 The vibrant colors stood out in the clear weather, even with the grasslands not at its reddest. 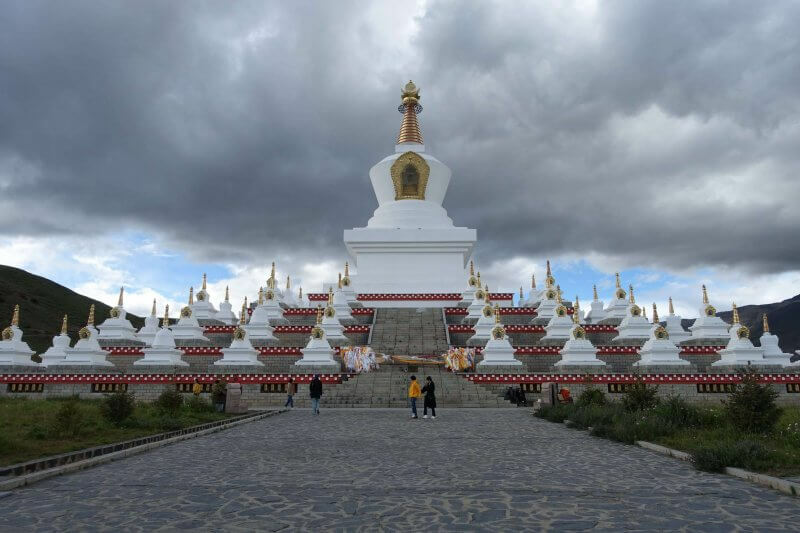 The last stop of the tour, the White Pagoda. Second time here, still enjoyed the view. Anything looks good in good weather. 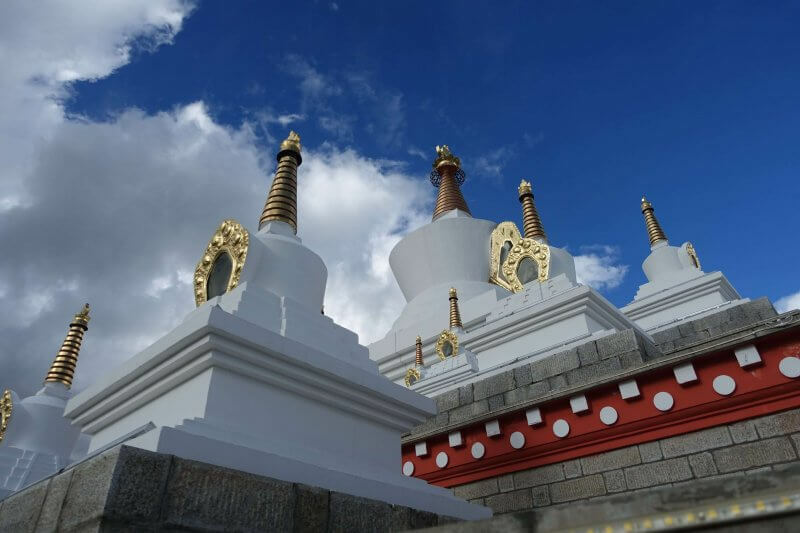 The White Pagoda of Daocheng. 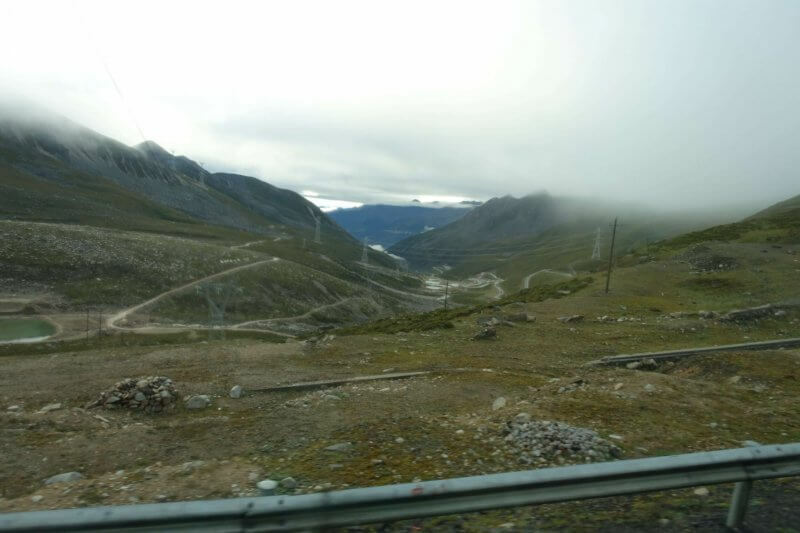 With that we got back to Daocheng in the early afternoon. As there was still plenty of time we decided to take the afternoon easy before going to the hot springs nearer to the evening. 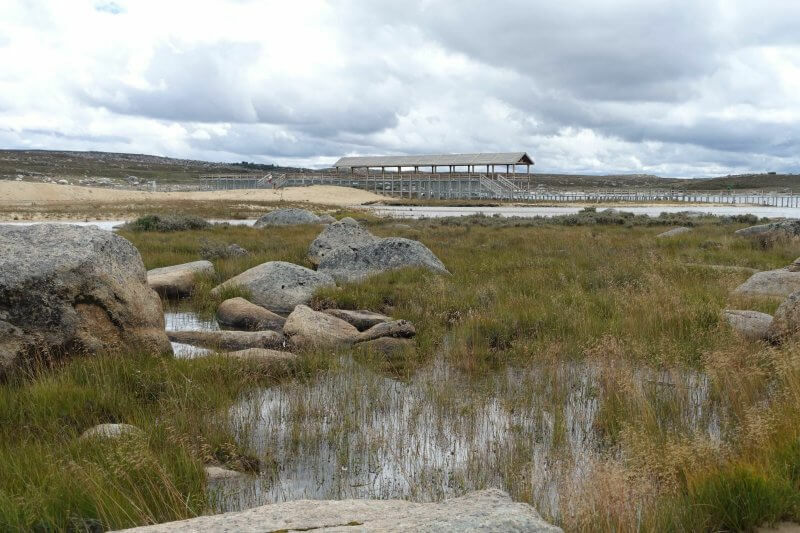 Just 4km out of Daocheng is the Rubuchaka Hot Springs, perfect for cold weather or for relaxing those aching muscles after a hike in Yading Nature Reserve. There are plenty of options to get there. If you’re up for a walk you it’s possible to head there on your own two feet. 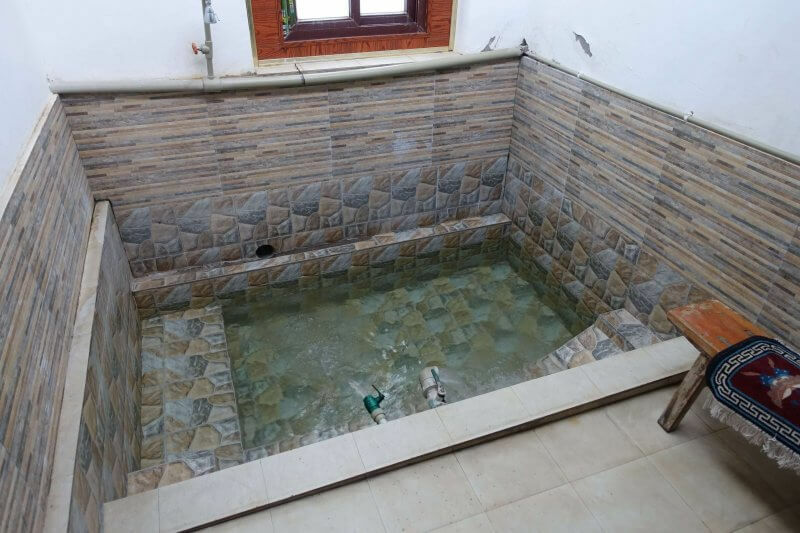 Alternatively you might want to rent a bicycle from your guesthouse in Daocheng to get there. 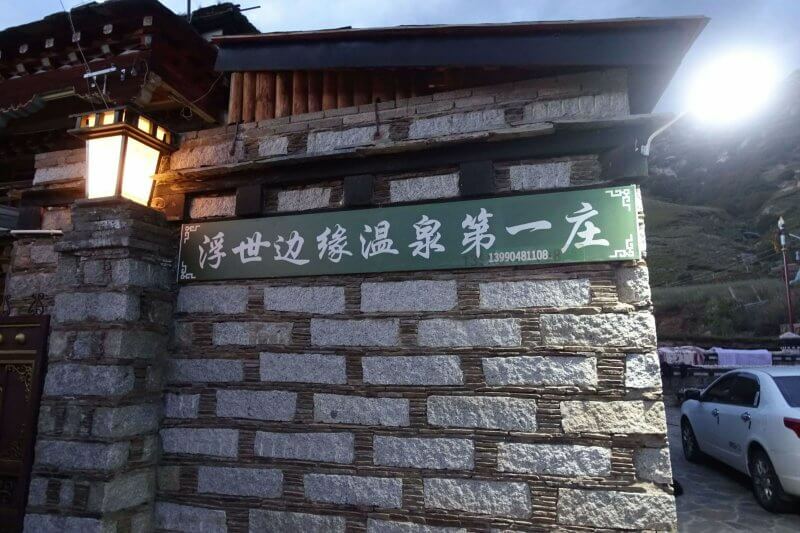 Finally, some or most of the hot spring businesses offer transfer service between Daocheng and their hot springs for free. Guesthouses/hostels/hotels would call them up and when there is a full load they would make the trip down to Daocheng to pick up guests. On off-season periods they may do the same even without a full load, but they might charge a fee for trips without a full load. The one we visited (30 CNY per person, no time limit) had private rooms which were basic but clean. The water can get very hot, but you can adjust the temperature via two taps, one for hot and one for cold water. We spent about 45 mins in soaking in the spring waters before washing up and returning to Daocheng. The private room we had at Rubuchaka onsen/ hot spring. The hot spring we visited. 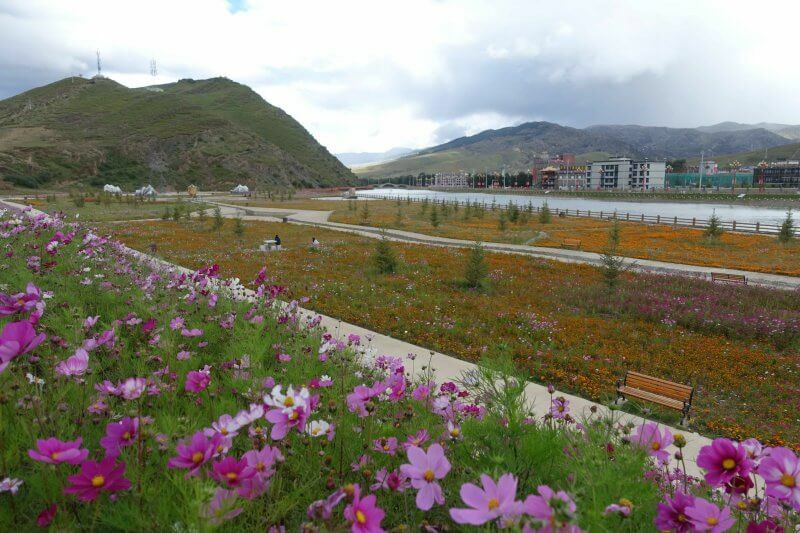 If you’re already in Daocheng and have some time to spare this might be a nice place to spend some time. 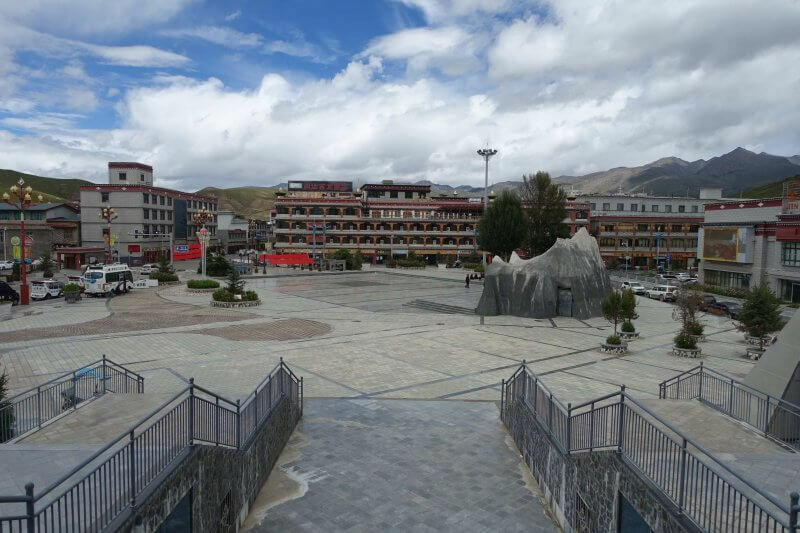 When the driver reached Daocheng we requested to stop by the main square for one last walk around town before it was time to leave the mountains (after a week in Kangding, Yading and Daocheng). My first impressions of Daocheng was that it was pretty dead, and I didn’t expect to see the dancing in the square that I had seen in many cities in China. On the last night I was proved wrong, as there was a big dance going on the main square. 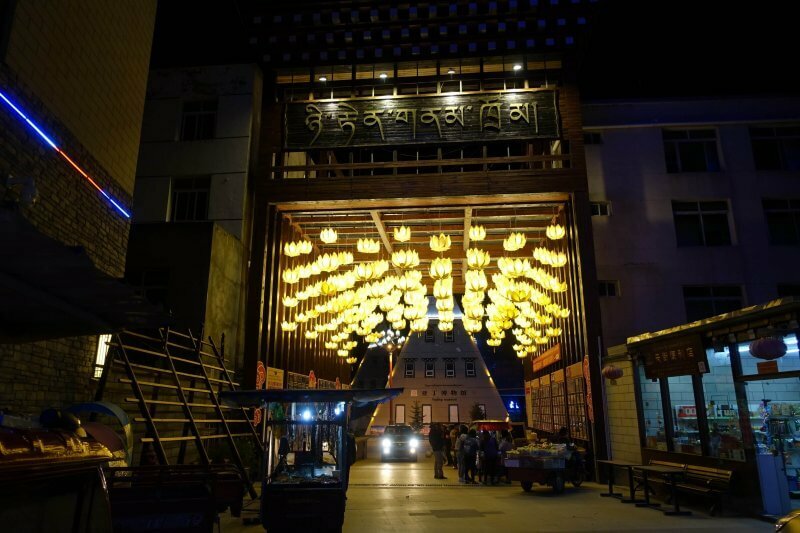 Not as crowded as the ones I had seen in Lijiang or Kangding, but still a sign that there is more than meets the eye even for a tiny city like Daocheng. 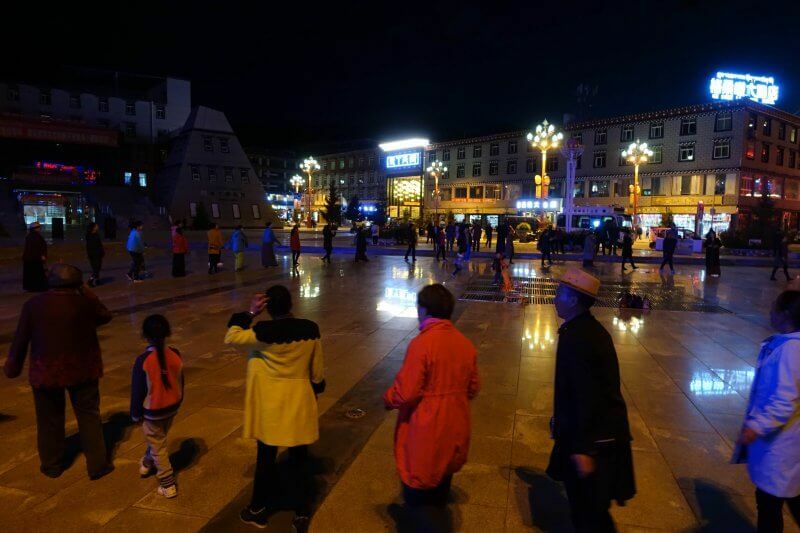 Dancing in the city square in Daocheng. Another side of Ya Ding Sky Street. And on the last night we found at least 2 more fast food outlets (other than Huacks) to get our fill of comfort food. Doesn’t sound like the best of ideas to travel this far and have some half baked fast food, but after a week in the cold, wet mountains (okay, mostly just 2 days in Yading) the city boys in us got the better of our diets. The next morning it was time for us to head back to the cities, first to Chengdu, then home the Singapore the following day. Our guesthouse got us to the airport (about an hour away) for 50 CNY per person, which I suppose should be similarly priced for trips between Daocheng and the airport. Just at daybreak we arrived at the highest civilian airport in the world, Daocheng Yading Airport, at 4,411m above sea level. Quite a small but busy airport, serving the hordes of tourists to Yading Nature Reserve (including us). Security here (as with most places in China) is very strict, and they examine every piece of luggage (check in and hand carry) very closely. I had a fire stone that had been with me for a couple of trips confiscated here. Anything that may start a fire is not allowed, including matches and lighters which some countries allow as carry on in singular quantities. During purchase of your tickets you should also ensure that your entire name is on the ticket, we had a small delay in getting our boarding passes as I hadn’t filled up our middle names, which had never been an issue for me ever before. According to some airport staff we could have been denied boarding passes due to the incomplete names. The world’s highest civilian airport, Daocheng Yading Airport, 4,411m above sea level. 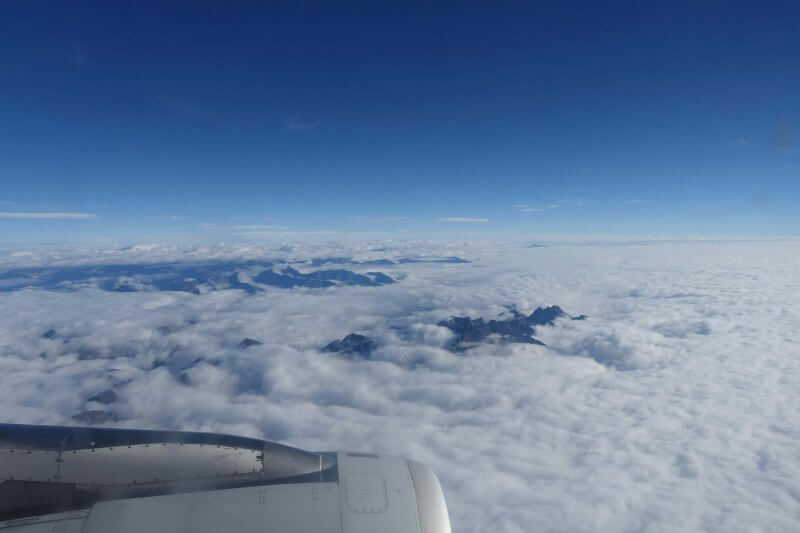 Soon, soaring across the mountains of Sichuan. Was hoping to catch some peaks but cloud cover was heavy. Nonetheless some peaks were sticking out from beneath the blanket of clouds. An hour later, we were back in Chengdu, where our adventure had began one week ago. One more day in Chengdu, before heading home!